Famed paleoanthropologist Richard Leakey is giving no quarter to powerful evangelical church leaders who are pressing Kenya's national museum to relegate to a back room its world-famous collection of hominid fossils showing the evolution of human's early ancestors. Leakey called the churches' plans "the most outrageous comments I have ever heard." He told The Daily Telegraph (London): "The National Museums of Kenya should be extremely strong in presenting a very forceful case for the evolutionary theory of the origins of mankind. The collection it holds is one of Kenya's very few global claims to fame and it must be forthright in defending its right to be at the forefront of this branch of science." Leakey was for years director of the museum and of Kenya's entire museum system. The museum's collections include the most complete skeleton yet found of Homo Erectus, the 1.7-million-year-old Turkana Boy unearthed by Leakey's team in 1984 near Lake Turkana in northern Kenya. The museum also holds bones from several specimens of Australopithecus anamensis, believed to be the first hominid to walk upright, four million years ago. 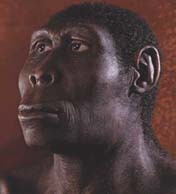 Together the artifacts amount to the clearest record yet discovered of the origins of Homo Sapiens. Leaders of Kenya's Pentecostal congregation, with six million adherents, want the human fossils de-emphasized. "The Christian community here is very uncomfortable that Leakey and his group want their theories presented as fact," said Bishop Bonifes Adoyo, head of the largest Pentecostal church in Kenya, the Christ is the Answer Ministries. "Our doctrine is not that we evolved from apes, and we have grave concerns that the museum wants to enhance the prominence of something presented as fact which is just one theory," the bishop said. Bishop Adoyo said all the country's churches would unite to force the museum to change its focus when it reopens after eighteen months of renovations in June 2007. "We will write to them, we will call them, we will make sure our people know about this, and we will see what we can do to make our voice known," he said. It was these comments Leakey termed outrageous. Calling members of the Pentecostal church fundamentalists, Leakey added: "Their theories are far, far from the mainstream on this. They cannot be allowed to meddle with what is the world's leading collection of these types of fossils." For its part, the museum sounded like it was trying to walk a tightrope. It said it was in a "tricky situation" in trying to redesign its exhibition space for all kinds of visitors. "We have a responsibility to present all our artifacts in the best way that we can so that everyone who sees them can gain a full understanding of their significance," said Ali Chege, public relations manager for the National Museums of Kenya. "But things can get tricky when you have religious beliefs on one side, and intellectuals, scientists, or researchers on the other, saying the opposite."